RadioGet allows you to find web radio stations (also known as podcasts) that suit your musical taste from among over 25,000 radio stations currently available on the internet. 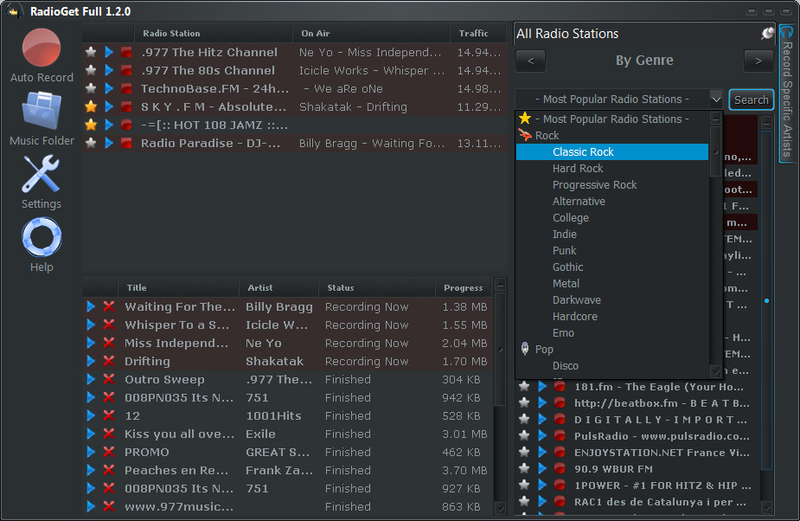 The right pane of RadioGet (All Radio Stations) will search radio stations that broadcast music of the genre you specify. Select a genre from the drop-down list or enter a genre and press Search to see a list of web radio stations that you can record, or listen to. ...... of free legal mp3 tracks in no time. RadioGet Full edition can also filter songs to record only those performed by artists you specify. * Easily record audio directly to MP3. * Listen to over 25,000 Web Radio Stations, Podcasts and Streaming Media. * Download Podcasts and Record Internet Radio Directly to MP3 files. * Record Multiple Internet Radio Stations and Audio Streams Simultaneously. * Add your Favorite Podcasts and Internet Radio Stations to the RadioGet Database. DVD/Video player. Is optimized for comfortable review of films. Support plugins. Qweas is providing links to GetRadio Full 2.2.8 as a courtesy, and makes no representations regarding GetRadio Full or any other applications or any information related thereto. Any questions, complaints or claims regarding this application GetRadio Full 2.2.8 must be directed to the appropriate software vendor. You may click the publisher link of GetRadio Full on the top of this page to get more details about the vendor.